Mfr Part: 24011D 026285000993 The Rifle Bore Snake scrubs and cleans the bore of your rifle in a single step. The built in, bench-quality phosphor bronze brush and braided floss scrub, clean and oil the bore in just minutes. Apply a few drops of bore cleaner to the front of the cord and oil to the end. Drop cord into the bore and pull through five times. Calibers: .17, 5.56mm, .22, .223, 6mm, .240, .243, .244, .257, .264, 7mm, .270, .284, .280, .380, .30, 8mm, .32, .338, .340, .35, .375, .416, .460, .50, .54, .204 The Rifle Bore Snake is washable and reusable and the lightweight design folds neatly away in new "den" carrying case for easy storage. Mfr Part: 24013D 026285001020 The Rifle Bore Snake scrubs and cleans the bore of your rifle in a single step. The built in, bench-quality phosphor bronze brush and braided floss scrub, clean and oil the bore in just minutes. Apply a few drops of bore cleaner to the front of the cord and oil to the end. Drop cord into the bore and pull through five times. Calibers: .17, 5.56mm, .22, .223, 6mm, .240, .243, .244, .257, .264, 7mm, .270, .284, .280, .380, .30, 8mm, .32, .338, .340, .35, .375, .416, .460, .50, .54, .204 The Rifle Bore Snake is washable and reusable and the lightweight design folds neatly away in new "den" carrying case for easy storage. Mfr Part: 24017D 026285001075 The Rifle Bore Snake scrubs and cleans the bore of your rifle in a single step. The built in, bench-quality phosphor bronze brush and braided floss scrub, clean and oil the bore in just minutes. Apply a few drops of bore cleaner to the front of the cord and oil to the end. Drop cord into the bore and pull through five times. Calibers: .17, 5.56mm, .22, .223, 6mm, .240, .243, .244, .257, .264, 7mm, .270, .284, .280, .380, .30, 8mm, .32, .338, .340, .35, .375, .416, .460, .50, .54, .204 The Rifle Bore Snake is washable and reusable and the lightweight design folds neatly away in new "den" carrying case for easy storage. Mfr Part: 24018D 026285001082 The Rifle Bore Snake scrubs and cleans the bore of your rifle in a single step. The built in, bench-quality phosphor bronze brush and braided floss scrub, clean and oil the bore in just minutes. Apply a few drops of bore cleaner to the front of the cord and oil to the end. Drop cord into the bore and pull through five times. Calibers: .17, 5.56mm, .22, .223, 6mm, .240, .243, .244, .257, .264, 7mm, .270, .284, .280, .380, .30, 8mm, .32, .338, .340, .35, .375, .416, .460, .50, .54, .204 The Rifle Bore Snake is washable and reusable and the lightweight design folds neatly away in new "den" carrying case for easy storage. Mfr Part: 24019D 026285001105 The Rifle Bore Snake scrubs and cleans the bore of your rifle in a single step. The built in, bench-quality phosphor bronze brush and braided floss scrub, clean and oil the bore in just minutes. Apply a few drops of bore cleaner to the front of the cord and oil to the end. Drop cord into the bore and pull through five times. Calibers: .17, 5.56mm, .22, .223, 6mm, .240, .243, .244, .257, .264, 7mm, .270, .284, .280, .380, .30, 8mm, .32, .338, .340, .35, .375, .416, .460, .50, .54, .204 The Rifle Bore Snake is washable and reusable and the lightweight design folds neatly away in new "den" carrying case for easy storage. Mfr Part: 24012D 026285001013 The Rifle Bore Snake scrubs and cleans the bore of your rifle in a single step. The built in, bench-quality phosphor bronze brush and braided floss scrub, clean and oil the bore in just minutes. Apply a few drops of bore cleaner to the front of the cord and oil to the end. Drop cord into the bore and pull through five times. Calibers: .17, 5.56mm, .22, .223, 6mm, .240, .243, .244, .257, .264, 7mm, .270, .284, .280, .380, .30, 8mm, .32, .338, .340, .35, .375, .416, .460, .50, .54, .204 The Rifle Bore Snake is washable and reusable and the lightweight design folds neatly away in new "den" carrying case for easy storage. Mfr Part: 24014D 026285001037 The Rifle Bore Snake scrubs and cleans the bore of your rifle in a single step. The built in, bench-quality phosphor bronze brush and braided floss scrub, clean and oil the bore in just minutes. Apply a few drops of bore cleaner to the front of the cord and oil to the end. Drop cord into the bore and pull through five times. Calibers: .17, 5.56mm, .22, .223, 6mm, .240, .243, .244, .257, .264, 7mm, .270, .284, .280, .380, .30, 8mm, .32, .338, .340, .35, .375, .416, .460, .50, .54, .204 The Rifle Bore Snake is washable and reusable and the lightweight design folds neatly away in new "den" carrying case for easy storage. Mfr Part: 24010D 026285000986 The Rifle Bore Snake scrubs and cleans the bore of your rifle in a single step. The built in, bench-quality phosphor bronze brush and braided floss scrub, clean and oil the bore in just minutes. Apply a few drops of bore cleaner to the front of the cord and oil to the end. Drop cord into the bore and pull through five times. Calibers: .17, 5.56mm, .22, .223, 6mm, .240, .243, .244, .257, .264, 7mm, .270, .284, .280, .380, .30, 8mm, .32, .338, .340, .35, .375, .416, .460, .50, .54, .204 The Rifle Bore Snake is washable and reusable and the lightweight design folds neatly away in new "den" carrying case for easy storage. Mfr Part: 24025D 026285001129 The Rifle Bore Snake scrubs and cleans the bore of your rifle in a single step. The built in, bench-quality phosphor bronze brush and braided floss scrub, clean and oil the bore in just minutes. Apply a few drops of bore cleaner to the front of the cord and oil to the end. Drop cord into the bore and pull through five times. Calibers: .17, 5.56mm, .22, .223, 6mm, .240, .243, .244, .257, .264, 7mm, .270, .284, .280, .380, .30, 8mm, .32, .338, .340, .35, .375, .416, .460, .50, .54, .204 The Rifle Bore Snake is washable and reusable and the lightweight design folds neatly away in new "den" carrying case for easy storage. Mfr Part: 24015D 026285001044 The Rifle Bore Snake scrubs and cleans the bore of your rifle in a single step. The built in, bench-quality phosphor bronze brush and braided floss scrub, clean and oil the bore in just minutes. Apply a few drops of bore cleaner to the front of the cord and oil to the end. Drop cord into the bore and pull through five times. Calibers: .17, 5.56mm, .22, .223, 6mm, .240, .243, .244, .257, .264, 7mm, .270, .284, .280, .380, .30, 8mm, .32, .338, .340, .35, .375, .416, .460, .50, .54, .204 The Rifle Bore Snake is washable and reusable and the lightweight design folds neatly away in new "den" carrying case for easy storage. Mfr Part: 24020D 026285001112 The Rifle Bore Snake scrubs and cleans the bore of your rifle in a single step. The built in, bench-quality phosphor bronze brush and braided floss scrub, clean and oil the bore in just minutes. Apply a few drops of bore cleaner to the front of the cord and oil to the end. Drop cord into the bore and pull through five times. Calibers: .17, 5.56mm, .22, .223, 6mm, .240, .243, .244, .257, .264, 7mm, .270, .284, .280, .380, .30, 8mm, .32, .338, .340, .35, .375, .416, .460, .50, .54, .204 The Rifle Bore Snake is washable and reusable and the lightweight design folds neatly away in new "den" carrying case for easy storage. Mfr Part: 24016D 026285001068 The Rifle Bore Snake scrubs and cleans the bore of your rifle in a single step. The built in, bench-quality phosphor bronze brush and braided floss scrub, clean and oil the bore in just minutes. Apply a few drops of bore cleaner to the front of the cord and oil to the end. Drop cord into the bore and pull through five times. Calibers: .17, 5.56mm, .22, .223, 6mm, .240, .243, .244, .257, .264, 7mm, .270, .284, .280, .380, .30, 8mm, .32, .338, .340, .35, .375, .416, .460, .50, .54, .204 The Rifle Bore Snake is washable and reusable and the lightweight design folds neatly away in new "den" carrying case for easy storage. 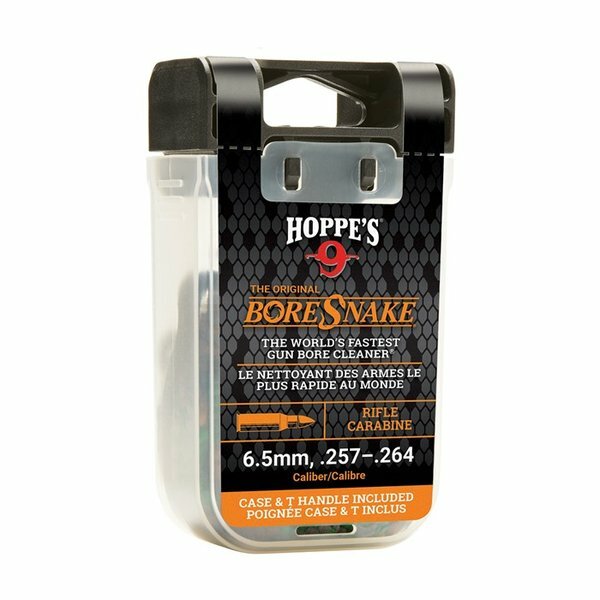 Bore Boss Shotgun Kit- 12 GA.